Subscribe to the Maroon Newsletter. Good morning. Welcome to the weekend. The University appears to have experienced water issues at several campus locations due to problems with fire sprinklers and pipe bursts as a result of the extreme cold weather. Incidents were reported at Cathey Dining Hall (which was temporarily closed Thursday), Eckhardt Research Center, the Kersten Physics Teaching Center, an office-area at the Billings Hospital building, and a UChicago office building at 6054 South Drexel Avenue. 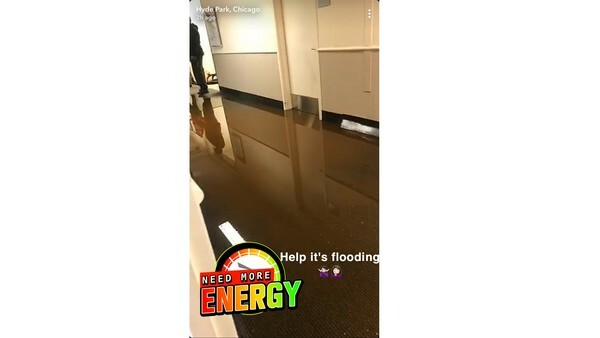 A video of flooding at the Billings Hospital building was posted to Snapchat. Eighty-four faculty and staff members sent a letter to administrators asking the University to investigate the firing of Lab Schools teacher Daniel Bobo-Jones, according to U-High Midway, the student newspaper of the Lab Schools. The teacher said he was discriminated against for being gay when the school principal scrutinized his text conversation with a student; the director claims Bobo-Jones was fired for falsifying a grade and for violating FERPA. The letter asks the University to step in due to the school’s lack of transparency regarding the termination. — A University spokesperson did not answer when asked whether the University would investigate the termination. Miguel Civil, a UChicago professor and one of the world’s leading experts on the ancient Mesopotamian language Sumerian, passed away on January 13 at the University of Chicago Hospital. He was 92. A memorial for Civil will be held in Bond Chapel on March 18 at 4 p.m.
Watch: The video team explores the history of integrating student housing on campus in the late 19th and early 20th centuries. Columnist Maya Holt interviews an assault survivor about the grueling process of filing a Title IX complaint. Columnist Brinda Rao criticizes the University’s ambivalence to the difficulties facing transfer students. $1 million: The Renaissance Society, a contemporary art museum on campus, received its largest gift ever from Joe Mansueto, the founder of Morningstar, and his wife Rika. The Mansuetos are also the namesakes of the University’s Mansueto Library. Booth professor Ayelet Fishbach co-published a paper showing that sharing a meal increases the likelihood that potential business partners cooperate on a deal. This week on Quadcast: University Theater. Learn all about one of the largest RSOs on campus, involved in everything from Shakespearean theater to Off-Off Campus improv. Bored, stuck inside? No worries the latest episode of our Dear Abby podcast is here. Writer Jamel Brinkley and editor Brigid Hughes discuss the role of editorial work in shaping stories. Though James McAvoy delivered a commendable performance in Glass, M. Night Shyamalan’s over-dedication to plot twists did not do justice to the characters developed in previous films. Ranging from puppet caricatures of Noam Chomsky to the performed hallucinations of a famed Andy Warhol assailant, the festival entertained, disturbed, and awed viewers. “Beautiful Soul” singer Jesse McCartney performed at the House of Blues after a four-year musical hiatus.